Gilberte Interiors, Inc. River View - Gilberte Interiors, Inc.
Because the owners spend their summers elsewhere, we needed to consider how the spaces would feel in the cooler months when leaves are down and skies are grey. Yes, New England is still beautiful in the late fall and winter, but the sun doesn’t shine as brightly or for as long around winter solstice and we need to take that into account when we design. From our first look, we started imagining how textures and shapes coupled with color tones and lighting would help the spaces transform through the seasons. Before the house was purchased, we reviewed the existing layout and proposed ways we could customize the place to best fit the new owners’ energy and lifestyles. 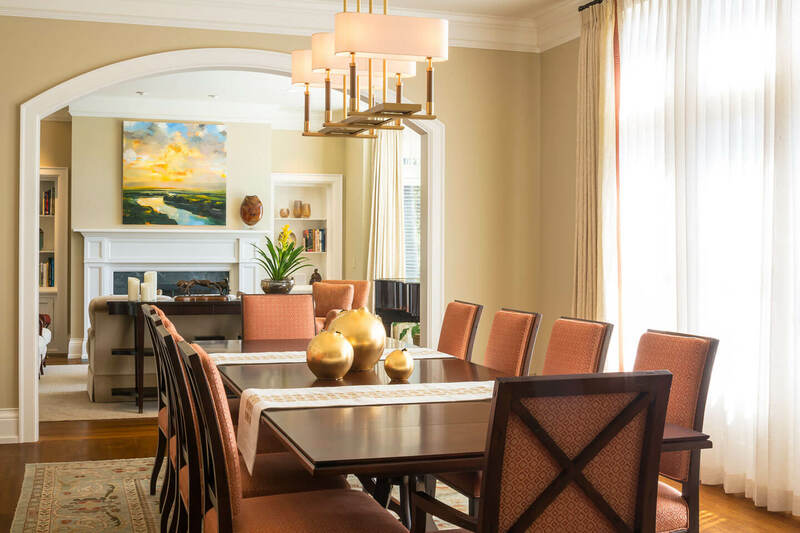 At the macro level, we crafted furnishing layouts complete with custom cabinetry, lighting, and woodworking. Then, we focused on the small details that would make it perfect, from new light fixtures to custom wood floor grates. These details would make the difference and we needed to bring the right team together to execute the final craftsmanship. All window treatments, bedding, and upholstery, as well as pillows and accessories, were fabricated in our own workrooms. Custom wood finishes, stone tops and hand-woven custom rugs were detailed and supervised by our design team at Gilberte Interiors. With the exception of a baby grand piano and a few other pieces the family had previously collected, we furnished all the spaces including the exterior patios and entryway. It was a true pleasure and honor to have the ability to help shape even the finest details of this home. You feel the success of the design and space from the moment you enter: elegant, warm, and welcoming, complementing nature, and holding you in its warm embrace.